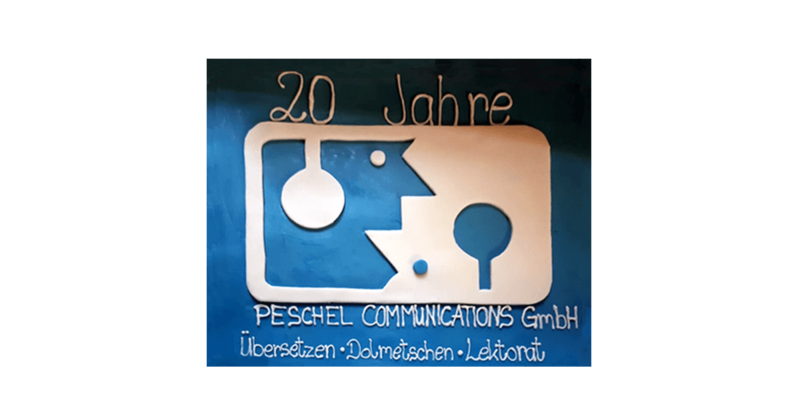 2018 marked an important anniversary for us, and that is why this year, I want to look back on the last 20 years at Peschel Communications. Thinking about the early days, the first thing that springs to mind is the people. I was still sharing offices with a small publishing house when I took the decision to hire my first employee back in 2000. This is a decision I have never regretted, because without Ellen Göppl it would have been impossible to build the company up to what it is today, continually adapting to new developments. Three years later, Andrea Unkelbach came on board — another stroke of luck for us. Even during her first months with us as an intern, Andrea displayed an exceptional knack for organising and a true “can-do” attitude. It was after this that we truly picked up speed, something which would have been inconceivable without the many excellent translators who worked with us, each and every one of them making their own personal contribution. Back then, our customer data were stored in a Microsoft Works spreadsheet and we translated using enormous dictionaries for reference. We were the proud owners of a fax machine with thermal paper — after all, many translations were delivered via fax (or saved on floppy disks and sent by post). Only some of our customers had email, so I bought a five-pack of floppy disk envelopes. Technology developed faster than expected, though, and I only ever used one of these envelopes. Seemingly overnight, everyone had an email address and a website (us included!). The next important technical innovation was the advent of computer-assisted translation (CAT) software, also referred to as translation memory software. Back in the day, you needed a dongle to make it work. In all honesty, we were reluctant to adopt the new technology, a technology that we now can’t imagine doing without! Our Excel glossaries have long since been imported into the CAT tool’s integrated terminology database, and translation memories (databases that store our translations) are an intrinsic part of our day-to-day work — as is the possibility for several translators to collaborate on a project, which makes things so much more efficient. Eventually, our offices on Friedrichring became too small, so in 2004 we moved to Wallstrasse, at the other end of Freiburg’s old town, where we still are today. These offices may now also be getting a bit small, but we’re reluctant to leave our wonderful high-ceilinged building, which dates back to the turn of the 19th century. Our records also found a new home when we introduced a software program which not only helps us manage client and project data, but accommodates our entire workflow — from a new enquiry to the final invoice — as well as supplier data. In the early years there wasn’t much division of labour, but as the company grew, a clearer structure became indispensable. Andrea took over the project management completely while Ellen and I translated, and all other tasks, from marketing to buying printing paper, were distributed according to who had the time and the inclination. Again, this setup had to adapt to the ever-growing number of staff. We now work with two project managers, both qualified translators, who use their translation know-how to coordinate projects and advise our clients. This allows our translators (four German and three English native speakers) to fully concentrate on their linguistic work. They all translate themselves and revise colleagues’ translations, depending on the project, because each translation delivered by Peschel Communications is revised by a second member of staff. In addition to our existing project managers and translators, we have created a role for managing private customer projects and providing general assistance to the team, and have also employed a marketing manager. And let’s not forget a steady flow of wonderful interns and our fantastic freelancers! The size of our company today means that it’s no longer possible for every team member to be able to perform every task. We have responded by creating a clearer organisational structure — a process which is still ongoing. At the same time, we’ve managed to preserve the spirit of a small team, for instance by holding a brief team meeting every morning. This is a chance to discuss general issues as well as the day’s business. Which brings me back to the people. I am deeply grateful for the opportunity to work with so many different people. Our anniversary party at the end of September gave me the opportunity to celebrate with my current team as well as many former team members — some of whom had travelled a long way to be there! I can certainly say that we have achieved a lot in the past 20 years. I can’t wait to see what the future has in store! Watch out for false friends!